Trimming and mowing are not enough to ensure that your lawn stays healthy and green throughout the year. Our company’s motto is “excellence above everything else”, therefore our lawn fertilization, weed control, and aeration services will ensure the health and beauty of your property. Of course, our team will also make sure your lawn remains the object of your neighbors’ envy. 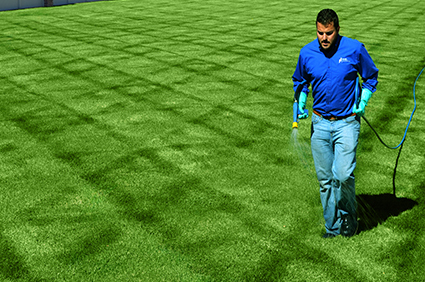 Lawn fertilization is the first step towards obtaining a green, thick, and healthy lawn. This type of treatment encourages deep root growth and ensures that your patch of heaven will stay green throughout the year. Our fertilization treatment program has been developed by our certified turf specialists who have many years of experience in the field. All formulas used for lawn fertilization are eco-friendly and of high-quality. The process is strictly monitored by our quality assurance team to ensure optimal results. On demand, we can issue monthly fertilization progress reports so that you stay informed about what happens each step of the way. Our company’s lawn fertilization process usually starts in late February – early March, when the ground is prepared to sustain the seedlings. The last step of our seasonal lawn fertilization program ends at the beginning of December when preparing the ground to receive next year’s seedlings. A good and efficient weed control program is just as important as lawn fertilization. Are you tired of picking up those pesky weeds that seem to pop from thin air? Then give us a call. We have the most efficient weed control program in the country, with incredible and fail-proof results. We have hundreds of happy customers who can vouch for the Holmes Property Maintenance’s weed control program. And we have a special offer for you – if you order the six yearly treatments package, we will throw in a grub prevention application treatment for free. All lawn treatments and weed control programs are environmentally friendly and in complete compliance with the industry’s standards. Aeration is a vital step towards obtaining a healthy lawn that thrives all year long. Many times our clients have asked us why this task is so important and when they should aerate the ground. Aeration is conducted to increase the oxygen exchange between the soil and the atmosphere by removing small patches of grass that obstruct normal air exchange. In the lawn service industry, the process is called core aeration, and it’s usually performed during the lawn’s growing season – early spring or fall. Why is it so important to aerate our lawn? Compacted soil resulting from construction working may prevent the roots from growing and absorbing the proper amount of water. Aeration will help the deep roots become stronger, absorb more water, which, in turn, translates into a green and beautiful lawn. Another benefit of aerating your lawn is related to the puddles formed after each rain. By properly aerating your lawn, you will aid the soil drain properly and the roots not be threatened by the formation of clay. Aeration also aids roots to absorb nutrients better and receive warmth. As always, our company is ready to offer you a customized lawn care plan on the long term, implemented by the most professional crew in the area at the lowest prices in the industry. But you don’t have to take our word for it: just give us a call, get some estimates and enjoy a thriving, lush lawn while benefitting from our 100% satisfaction guarantee policy!